So I don't usually write about the records I post on this blog but this record is kinda special to me, not only was it recorded just outside of my home town (Penticton, B.C.) which has very little great musical output (at least the music you and I enjoy! ), but aparently it features my uncle Jim Beattie on vocals (backing maybe? Carmen help me out here please!). The greatest thing about it is that it's actually a pretty darn good song. If you have any interesting family musical history please leave a comment and tell me about it. I think you're right! I've passed on the link to ol' pappy, so we'll see what he has to say about it. Rad find! Hi VAUGHN, u turn a good blog! Great to see that record. I was thinking about it recently and wished that I had a copy of it. 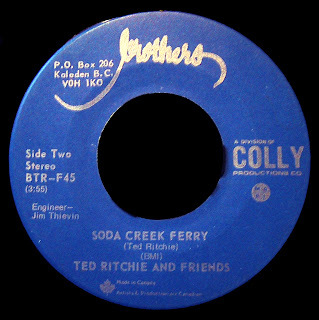 Yes, I did have something to do with the record and I am singing back up but not on Soda Creek but on the reverse side, Billy Fry. Ted had written these songs when he was ranching up in central BC and when he returned to Narmata he decided to record them at the Thieven Brothers studio in Kaleden. I remember that Bob Kinnear was on the record and a flutist, a British fellow... Janet might remember his name. Ted was the guitarist. Doug Mathias may have played bass. I was my first and only recording experience and one that I will always remember. I took the record and sent it to a number of radio stations in BC and maybe even in Alberta. I remember hearing it played on the Penticton station... I can't recall which one. Gee this sure brings back memories... just like the song..."Say old Stett, I haven't seen you for a while, sure is good to see your smile. Set down and have a drink with me. We can talk about the days gone by, the open plains and the midnight sky, about the times when you were ridin' with me. So many roads that I've been wandering down, so many friends I've left behind. It's time I headed back to those hills and Billy Fry. I'm always comin' down at sundown time." Vaughn, thanks for this opportunity to reminisce about a great time for me. I hope you're well and I'll call the next time I am in town. ... and I'm Jim Thievin's brother, one of the other brothers for whom "Brothers Studio" was named. This wasn't just a good song. It was a great song, and we urged another artist to re-record it. Betty-Anne Northup, an amazing singer in her own right, did a cover of Soda Creek Ferry using session players. It was never vinylized. I imagine we have analogue copies somewhere, equally priceless. Thanks so much for the history lesson everyone, and thanks for this great song to all those involved. I still have a few copies of the 45 in my basement if anyone wants one. Shortly after we recorded it, Jim Thieven asked me if I would change a word or two so a girl from Seattle could record it- I said no. How stupid was that? How things change. The Soda Creek 45 made it to #23 on the coountry charts in Eaglesham Alberta. Eaglesham is somewhere north of Edmonton. I think I received a royalty cheque for $7. I have no idea how long ago these posts were made, but I'm a former student of Ted's when he taught guitar in Penticton--1980-81. He was an amazing teacher! Ted, if you're still watching this thread you can look me up at facebook.com/fridaydreamer. I'd love to hear from you! Since there are comments here from the Thieven Brothers, I'm curious about the Gage sisters, Wendy and Stephanie too--do you know where they are or if they're still singing? I am Ted's daughter, Deanna, now living in Victoria. I remember growing up listening to these tunes...what a way to slowly fall asleep as a kid, amongst guitars and folk vocals in the background. Amazing! Check out some more recent recording of these and more songs on the Dundeel CD that was recorded more recently. The group is no longer together but they have some amazing 4-part harmonies and new songs on this album. Soda Creek Ferry as in one that would have run on the Fraser between Williams Lake and Quesnel? Would you please email me? I would really like to buy a copy of this, if possible. My email is exte82@hotmail.com. Is Ted Ritchie still there ?